SPEAKER: This is a production of Cornell University. ART DEGAETANO: Really, one of the things that I'd like you to get out of the talk today is the idea that when we talk about climate, we really have to think about the earth or climate as a system. We can't just look at one thing. We can't just look at the greenhouse gases. We can't just look at the atmosphere. We can't just look at the oceans. But everything kind of works together very nicely in sort of a symphony. And we'll see some of these interactions, hopefully, as we move through the talk. Really, when we talk about climate, or actually changes in the climate system, there's really two angles we should come from. The first one is natural-- there are lots of things in the climate system that vary naturally. People who attended class today saw that there were natural variations in the sun's intensity on fairly regular cycles. We can extend that to even longer periods of time and talk about changes in the earth's orbit, where we see ice ages, perhaps. We see volcanic eruptions that are naturally. And looks like you're going to be talking about at least some aerosols later on in the class. So I'm sure there'll be a mention of that. We're in El Nino year this year. And again, one of the things that's probably contributing to why last year or this January has been one of the warmest on record is this natural variation in the climate system. And then there's a lots of interactions between the different components in the system, which we'll mention a bit later. Then, of course, we're all here, at least in some form, to look at the human parts, things, factors that affect the climate system-- so things like increasing greenhouse gases, increasing aerosols, things like dust, or other pollutants, deforestation are some great examples of that. All right. So again, those of you that have been in class, you know the primary source of energy for earth is the sun. And we get our sun via radiation-- electromagnetic radiation. It's the way that not only the sun brings its energy to earth, but the way that the earth gives away its energy to space. And I've kind of on the bottom there put a check book because very much this idea of climate-- or having a stable climate-- is very similar to trying to balance your bank statement, right? If you have as much money coming in as you have going out, your balance stays the same. We can make that analogy to climate to say, if we have the same amount of energy that's coming in from the sun that the earth is trying to give off to outer space, we have a nice stable climate in terms of temperature. So really, let's look at some laws. Basically-- at least here, I have two laws. And these are the most important for today is anything that has a temperature-- anything that has a temperature above absolute zero radiates energy-- emits radiation. The sun does, I do, you do, the seats do, the walls do in the class. Anything that has a temperature is emitting radiation. And it's emitting radiation basically as a function of its temperature. Again, this bottom equation here gives that equation-- T to the fourth power. Fourth power-- many, many times. So something like the sun that's 6,000 degrees, when we raise 6,000 degrees to the fourth power, that's a lot more energy that it might give off as opposed to, say, the earth, which might be sitting there at a temperature of 283 or something like that degrees C. So again, that fourth power is going to be important. And then again, kind of the third law is balance. For a stable climate, we need to have balance. What comes in from the sun has to equal what goes out from the earth. So let's look at that. You know, it wouldn't be the science of climate change without some numbers and equations. But I'll try to approach this at least in words. When we look at the ins, again-- whoops. This is not going to work. How about we do it with the mouse? All right. If we look at the ins, really, again, the in is-- the only thing that's coming in is the energy from the sun. When we look at the outs, I have two things that are going on here. And these are going to become important. Really, the first is the outgoing radiation from the earth. Earth has a temperature, so it emits radiation, according to this law to the fourth power. The other part up here is the reflected solar radiation. Not all of the energy that comes into the earth is absorbed. Some of it's reflected by the clouds, perhaps, by the ice caps, by the sea ice, right? When we did have snow here this winter, we kind of, at least on a bright sunny day, saw that there was a lot of glare. You had to wear your sunglasses. That's the solar energy being reflected by the snow cover. So these are the two ways, at least in this very simple type of equation, that we can measure the outs from the system. We can put that together in an equation, and it looks like this. But really, notice this equation. The point that I want to make is we know what S is. It's the amount of energy that comes in from the sun. Class, what is it? The solar constant. Thank you. R is the radius of the earth. Sigma's the constant. So the only thing we don't know is T. So we can do a little algebra to this equation and figure out what T is. And if we do, we do the math, and we say, boy, the temperature of the earth is a balmy minus 18 degrees C. Uh uh. Ain't working. This is-- I'm not going to say this is wrong. This is the model. This is what we have to look at. So no, I don't think our model is wrong. But I think our model is incomplete. In the key part here to the incompleteness of the model is I've forgotten a very important part of the climate system. I've forgotten the atmosphere, forgotten the greenhouse gases. So even in the normal case-- forget about us putting more greenhouse gases into the atmosphere. Even in the normal case, we have greenhouse gases in our atmosphere, and they play a very critical role in regulating the earth's temperature. So the real picture is we forgot about the atmosphere. And I'm going to just-- there's a nice picture. I've kind of drawn it most of the energy coming from the sun. The atmosphere is like a window to the sun's energy. The sun's energy just passes through. It's really not reflected. It all pretty much makes it to the surface. And that surface-- yes, some of it is reflected. About 30% of it is reflected. The rest of it is absorbed by the earth. And then the earth, again, has to obey this radiation balance, has to emit energy at Sigma T to the fourth. And so it does. But it's then that the atmosphere gets in the way. And it blocks it. You know, I could use the analogy-- it's like a blanket, right? We put a blanket on us, it traps some of our body heat. That's why we stay warm at night when we do it. So loosely, that's what this atmosphere that the earth has is doing to the radiation that's trying to leave the earth's system and go back out to outer space. So let's look at the atmosphere. And I think the best way to describe the atmosphere-- I didn't know I had this animated-- kind of puts it into perspective. So if we think of the atmosphere as a keg of beer, the majority of it-- 75% of it is nitrogen. About 25% is oxygen. And a little bit-- about 1% is argon. OK. And that comes out to be 99.9 almost percent of the atmosphere. And then over here in half the shot glass is something like the carbon dioxide and the other greenhouse gases. And it's these gases that even though they're such a tiny, tiny part of the earth's atmosphere, measured in parts per million-- not percent, but part-- no percent is part per 100-- but parts per million, they really are key in kind of controlling this radiation balance that the earth has to establish. All right. So again, that's kind of what I said in words. And another point to make has to do with wavelengths and the types-- the frequencies of energy that both come in from the sun and leave the earth's system from the earth's surface-- this Sigma T to the fourth value again. The sun's energy has very small wavelengths-- less than 4 micrometers. OK? But the earth emits in a longer wavelength-- infrared radiation. And it's really where these gases-- the water vapor, the carbon dioxide, the methane, the nitrous oxide, the ozone, to some degree, the chlorofluorocarbons-- in the atmosphere come into play. Because in general terms, they're transparent to the short wave energy, except for maybe ozone, from the sun. Sun's energy just passes through just like light through a window. But when the earth tries to give off its energy to space to establish this balance, the greenhouse gases get in the way. And they absorb that energy and then redirect it back down to earth. So in my model that I did before, where we only had the sun's energy coming in, we forgot about all that energy that's being redirected from the greenhouse gases. So again, let's kind of get you oriented in this graph. This is wavelength. And conveniently, I've made the wavelengths that the sun mainly emit at in yellow and the wavelength that the earth mainly emits at trying to get rid of its energy in blue. So those are wavelengths. And really, if you look up and down on this graph here, what this represents is when it's 100, or when this graph up at the top is gray, it means all of those wavelengths are absorbed. They don't make it in if they're coming from the sun, or they don't make it out if they're coming from the Earth. So if I choose over here in the yellow-- this is the sun's energy coming in. And yeah. There's a lot of wavelengths maybe here-- very short wavelength-- that the sun blocks out. That's where-- that's the ozone in the stratosphere, right? We've all heard of the ozone hole, or the ozone layer. You know, it protects us from the ultraviolet radiation of the sun. That's a good thing because ultraviolet radiation causes cancer and other nasty things. But the ozone in the stratosphere, that gas-- notice here are the different gases. So ozone is down here. Almost all of that coming from ozone-- absorb those radiation-- that radiation, and it doesn't make it into the surface. But other than that, really, except for maybe a few things over there, the majority-- the lion's share of the sun's energy makes it down unimpeded to the earth's surface without getting absorbed. When we go over to the other side, however, we see lots of gray areas in this blue band. So there's lots of gases in the earth's atmosphere that absorb longwave radiation from the earth and then redirect it-- re-emit it back downward toward earth. And most of those are water vapor, carbon dioxide, and then the other greenhouse gases-- methane, nitrous oxide. What I want to show in the next few slides, at least kind of conceptually and then a little bit mathematically, is that why, when we add more of these greenhouse gases, do we have to see the temperature go up? Forget all the debate. I mean, the science is there, and actually, very simply in these next couple of slides, that if we look at the math in physics-- the core math in physics-- if we add more of these greenhouse gases to the atmosphere, we have to see the temperature rise or our equation doesn't work. And, you know, we'll see the equation is a pretty simple one. All right. Why do these greenhouse gases get involved? Well, they get involved mainly because of-- for lack of a better word-- the wavelengths that turn them on. Molecules like to get excited. And they only get excited about certain wavelengths. Oh, quit shaking your head, Carolina. [LAUGHTER] They respond to different wavelengths. So here's an example of carbon dioxide. And carbon dioxide really likes energy at 15 micrometers. Causes its bonds to bend, causes the molecule to vibrate. All right? And once the molecule absorbs that energy, it's blocking it. It's taking it out of the system. So it's saying, hey, I like this wavelength. I'm going to capture it. It's going to cause my molecule to bend in this case, typically taking it out of the system. But eventually, that molecule is going to give up that energy it grabbed. Again, think of this carbon dioxide molecule, again, like your checkbook. It gains some energy, it gains some money from your job. But eventually, you give that energy back up. The carbon dioxide molecule, the atmosphere is really doing the same thing. So here's my picture. And don't really worry about the numbers. But worry about this idea of balance. And in my picture here, I really want to talk about the climate system as kind of maybe three boundaries. Think of it as number one being sort of up here. It's outer space. So the sun-- let's say from outer space-- delivers a certain amount of energy to the earth's system. For the climate system to be in balance, that same amount of energy has to leave the earth's system and go into outer space. So really, I have, in this case, 238 coming in from the sun. And somewhere up here going out to space, I also have 238. That 238 is coming from the atmosphere. It's the energy that the greenhouse gases have absorbed in the atmosphere . And there's nothing special in this case about up. So if this atmosphere has gained a certain amount of energy, and it starts to radiate that energy, radiates it in all directions. So think of the sun. If the sun is radiating 238 toward earth, it's also radiating 238 in the other direction, and straight up, and every direction it possibly can. OK? So we're just looking at one direction here to get this number. The point that I want to make is if the atmosphere has to deliver that much radiation upward to space, it also has to deliver that much radiation back downward, right? If I have this eraser, and it has a temperature, and it's emitting energy at Sigma T to the fourth, it's emitting Sigma T to the fourth that way, that way, that way, that way, that way, every possible direction. Atmosphere is doing the same thing. So now, look at the picture. If I'm worried about how much energy the surface of the earth gets, it's not only getting energy from the sun, but it's getting energy from the atmosphere. So it has another source of income, OK? Just like having a second job in my bank account example. And we all know if you have a second job and you don't spend any more of that money, your balance is going to go up. So the same thing here. The earth's temperature is going to go up unless it starts to emit more energy keep it in balance. So there's my bigger number. So let's look at that a little bit more. Those are the numbers. I said that. I don't know-- you can look at it. I don't have time to digest that. But the idea is every one of these boundaries-- what comes in must be balanced with what goes out. What goes out must be balanced by what goes in. So the atmosphere gains a certain amount from the surface of the earth, it's got to lose the same amount. These greenhouse gases have to balance to zero. What they absorb and what they emit has to equal zero, or their temperature is going to change. Outer space loses a certain amount of energy, it has to gain the same amount of energy. That balance has to be zero. Same thing with the surface of the earth. So now-- really ugly, but really, all we have are two equations and two unknowns in this very, very, very simple model that I'm building. We don't know what the temperature of the surface of the Earth is. We tried to solve that before, and we got too cold. The only other thing that matters is how hot or cold what the temperature is of the atmosphere. So I can maybe look at one equation that balances my greenhouse gas layer in the atmosphere. This is what it absorbs from earth. This is what it tries to get rid of. Needs to be in balance. And then I have my earth's surface. What it gets from the sun, what's loses due to reflection-- guys in class, you know where that four comes from. What the atmosphere tries to give off and-- what it gains from the atmosphere and what the surface of the earth tries to give away to space. Ts, Ta, Ts, Ta-- the only things we don't know. So we can solve this-- I'll lose my voice-- and get an equation like this. So we know what the temperature of the surface of the earth is. We know what the amount of sun is. We can estimate how reflective the earth is. This a is how reflective it is. And this E-- I'm going to use this E-- at least in my talk right here, you can think of it as the amount of greenhouse gas in the atmosphere. It's not quite that. But for this purpose, that's the concept, all right? So if you notice, I can solve this. I'm going to-- I know what the numbers are. So I plug them in, and I can solve the math. And I get something like the earth is 59 degrees C. And that's pretty darn close to what the average temperature of the earth is. So by adding in this atmosphere-- and again, you have to trust me that these numbers are correct-- the model works. But more importantly, let's look at how things affect this model. OK? The only two things can really change are how reflective the surface is-- this a-- and how much greenhouse gas there is in the atmosphere. So for an example, if perhaps I increase this number e, I put more greenhouse gas in the atmosphere, what happens? This number here-- this e over 2 gets bigger. 1 minus that gets smaller. And that happens to be in the bottom of the fraction. So this whole part of the equation becomes bigger. So if this increases, this has got to increase, OK, mathematically. E represents the amount of greenhouse gas in the atmosphere. If it goes up-- if more energy is absorbed-- the only thing that can happen to temperature is it increases. Or maybe a more conceptual example, let's look at this a. Let's say in this case, I add more ice to the system. Ice is very reflective. So I'm making the earth more reflective. a is increasing. a is a bigger number. 1 minus a is a smaller number. So therefore, this part of the equation decreases, and the temperature decreases. So at a very, very primary, foundational level, this is kind of the math that governs the idea of climate change. If we add more greenhouse gases, this number gets bigger, the temperature has to increase. If we monkey with the albedo-- that's what the a is-- if we make the earth more or less reflective, this number-- if we make it more reflective, this number goes down. And therefore, this has to go down. It's all it is. I wish. All right. So let's look at that a little bit more in depth. And really, there can be any number of changes to the climate system. I've just picked on increasing the greenhouse gases. But really, let's look at a number of things that might be going on. I'm going to use the word forcing to describe them. So really, all I mean by a forcing is it's something that perturbs this radiation balance. It either adds more energy to the system or takes away more energy from the system. And that's what I'm going to call a forcing. And it could be a change in the atmosphere's composition, it could be the sun getting brighter or dimmer, perhaps, it could be a change in how reflective the earth is. So what are some of these forcings? So kind of a dated graph here, but it's the best I could do to show all of them together. We're changing the greenhouse gases. We're changing the composition of the atmosphere. Even though these represent very small parts of the atmosphere-- you know, parts per million for carbon dioxide, parts per billion for methane and nitrous oxide-- we're changing those key components of the atmosphere. Those key components-- and actually, really, the few components of the atmosphere that can really absorb this longwave energy that the earth is trying to give off. And just looking at this time series, you know 1900 is here. And I don't think anybody will argue with me. This is a remarkable increase in essentially my lifetime. You know, we're going from these baseline values to almost double. And again, this is a bit dated. If I were to look at the carbon dioxide graph, which is in red, today, in 2016, it'd be up here someplace. OK. So from 2000 to 2016, you know, what? It's kind of almost you guys' lifetime, or most of your lifetimes, we've seen this-- even a big change that I have to go off of the graph in this case. What causes these increases? Well, again, it's our emission of fossil fuels. So showing here, basically, the three main culprits in terms of adding CO2 to the atmosphere, by far, in red, the main one is burning fossil fuels. So currently, today, we emit 10 gigatons-- 10 billions of tons-- of carbon into the atmosphere each year. It stays there for a long time. Can't help but have that concentration go up. Again, going back to my initial example, it's like pouring shot after shot after shot of CO2 back into the system and not getting rid of it until a very long time to effect the system. A small amount from cement production, and also amount deforestation. Deforestation-- the trees-- the forests of the world actually act as sinks for the carbon dioxide we put into the atmosphere. Doesn't stay in the atmosphere, but it goes to build the biomass in the forest. So if we cut down forests, we lose that carbon as that wood or biomass decays, but we also take away one of the sinks for the carbon that goes into the atmosphere. So if we look at all of the possible forcings that there are in the system-- and again, it will take all semester to go through all of these-- I want to make a couple of points with this. If we look at-- so zero represents no radiative forcing. Anything kind of up here in the yellowish area represents a positive forcing, or warming. OK. We've absorbed more energy somehow. The earth's surface has gotten more energy, either from the greenhouse gases, or maybe the sun has gotten brighter. Anything on the bottom represents losses. Most of these things are the earth getting more reflective in a lot of cases. Here might be an example. This is the ozone in the stratosphere, so it blocks the amount of sunlight coming in. So that would be a forcing if we change that. So really, the point that I want to make is there's lots of forcings that are going on. All of these forcings are anthropogenic, except for maybe I guess the last one here with the solar. OK? So we've basically caused most of these forcings. Notice the biggest bars are the greenhouse gases. So it kind of puts this into perspective that the amount of change in the system that we've brought about is primarily due to the greenhouse gases. It may be very little to do something like natural variations in the sun. So if you hear a skeptic or a denier, they might say, oh, there's these natural variations in the sun. And we're getting more solar radiation. So of course the temperature of the earth should go up. Yeah. They're right, but by a very small amount compared to the greenhouse gases. We need to treat the climate as a system. So again, I'm going to pick on my class. We used the example today or in last class-- yeah. 2015 has been really, really warm. Why? There's a lot of greenhouse gases in the atmosphere. There is an El Nino-- a natural change in the system which tends to make the system warmer. And we've seen more solar radiation. So that adds to it. I'm going to skip these. Notice most of the negative ones have to do with aerosols in clouds. And I'm sure Dr. [? Mahalwald ?] will cover that in gory detail in a few lectures. So I'm going to skip on that-- Dr. Hess, maybe. But notice there are things in the system that we add that do cool the climate system. One of these are sulfate aerosols. Comes from burning coal and things like that. So keep that in mind for one of the next graphics that I might show. How am I doing with time? Not bad. I'm going to quickly touch on another topic, which is very important. It's called feedbacks. OK. And really, what a feedback is-- if I push the system one way, something happens to the system, and it makes it keep going in that direction. So if I do something like add greenhouse gases to the atmosphere, and I make the earth warmer, some of the snow, and the ice, and the sea ice melt. And if that ice melts, it makes the earth less reflective. Less of the incoming solar radiation reflects back to space. So more of it is available to absorb. So not only by adding greenhouse gases, do I get more down wave radiation from the atmosphere, less of the radiation that's coming in from the sun gets reflected. It's a double whammy to the system. So I make the earth warmer, less ice means more of this can be absorbed. It means I warm the earth even more, which means I melt even more snow and ice, which means the albedo-- the reflectivity-- decreases even more, which changes it even more. So when we look at some graphics, we're going to see the poles, especially now, have seen huge changes, part of it due to this feedback mechanism. Carbon dioxide might get involved. If I warm the atmosphere, some of the carbon dioxide that I emit not only is stored in the atmosphere, but it's stored in the ocean. But the ocean holds less CO2 when it's warm. Less of that CO2 can go into the ocean. Less of it can dissolve. So as I warm the atmosphere by adding more CO2, and I warm the ocean, some of that buffer of CO2 that I have in the ocean isn't there anymore. So that accumulates more even more CO2 in the atmosphere, which warms the system even more. Again, an example of a positive feedback. Unfortunately, most of the feedbacks in the climate system are positive. If we warm the climate, we see more warming. Perhaps one example might be clouds. And this is where there could be-- there is, I would say, a lot of debate in the literature. Or actually, clouds or water vapor in the atmosphere kind of play two roles. So I kind of put this out there as an example of a negative feedback, where we warm the ocean, warm the atmosphere, we add more water vapor to the atmosphere, and in some places, and in some cases, we might get lower and thicker clouds because of this additional water vapor and moisture. And you all kind of know on a cloudy day versus a sunny day, it tends to be cooler during the day. So there's a negative feedback. If we increase these clouds, we have less sunlight coming in, we might cool the system. But again, think of that one step further. Think of your intuition or your experience. A cloudy night versus a clear night-- is a cloudy night cooler or warmer than a clear night? Ithaca, lots of cloudy nights. Well, no. At night, the clouds trap the long wave radiation that the earth is trying to get rid of, so they warm the climate. So they kind of play a dual role in this case. And I just happen in this slide to pick on one to show there are things that could lead to a negative feedback. All right. So kind of bringing it here home to the home stretch. What have we seen? This is the temperature of the earth over the last 100 plus years. Kind of an anomaly, based on the 20th century average. So basically, this zero line-- any year that happens to fall right on this zero line-- and there aren't many of them-- are exactly that long-term average for the 20th century. And really, what we see, remarkably, is the early part of this period-- all the blue bars are all below the long-term 20th century average. And the more recent years, quite remarkably, from about 1980 onward, are all above the 20th century average. So if we look at this a very substantial, a very statistically significant warming trend in the data. And this is up until the present. Here's 2015. Again, the warmest year the world has seen in its instrumental record of over 100 years. And notice the number of records-- 2015 is the new record. 2014 was the old record. So we broke the record in just a year. Some lower years here-- you might argue that 2012 was the record before that, 2000-- or 1998 was the record before that. So you know, it's been-- in teaching my climate change class over the last 10 or 12 years, it's been remarkable how often I've had to update my slides that say, the record temperature, or the record year has been this, because it's been year after year after year, more or less, that we've been breaking the record. Here's the pattern of change. Where does-- where is-- where are the anomalies, the biggest and the smallest? And yes. My example, if we look at the northern hemisphere arctic-- these very dark and in some cases purple boxes up in here-- that's where the change has been the greatest-- over 2 degrees C per century as a trend. But if we look at this whole entire globe, almost all of the colors are reds and oranges showing almost every place on Earth has seen warming. Very few places-- maybe the North Atlantic being the one place that's seen cooling. And we could argue there that this is also a sign of climate change, in a way, with what happens in that part of the world. That's no data there. That's not a color. So again, this feedback affecting the arctic. All right. So you might say, hm. Are these changes due to the greenhouse gases, are these some type of a natural cycle? And one of the ways we can look at this is by using climate models. So again, it'd be another number of lectures to talk about what a climate model is. But I think this is a very important graph to kind of show in an overarching talk like this. And basically, the black line up and down represents the observations. So it's showing this long-term warming trend over much of the 20th century. The green and the blue areas represent what a climate model would have predicted the temperature would have done if it only took into account the natural changes in the climate system. The sun may be getting brighter; volcanoes going off or going off more frequently; things like that. The blue represents what the climate models simulates if it takes into account both the natural variations and the greenhouse gases. So if we notice, the observations and the models track along pretty good till we get to about 1970. And then we have a problem. If we ignore the greenhouse gases, the models, which actually track the observations pretty well, deviate. And they deviate quite a bit. They say, hey, the earth should be staying stable or getting cooler. It's only if we include the increase in greenhouse gases can we replicate what we've actually seen on Earth with the models. So I would argue this is pretty striking-- pretty striking evidence that since 1970, the increase we've seen has everything to do with the greenhouse gases we've added to the atmosphere and actually very little to do with natural changes in the system. What about the future? Kind of wrapping it up here. And this is an old graph, but the idea here is that in almost every case, if we go out another 100 years and look at the amount of carbon dioxide society is going to emit to the atmosphere in a given year, in no case do we really get any better than we are today. So any projections for the future to say, you know, what are greenhouse gases going to do in the future? In the best case-- this green case, we pretty much stay status quo. We emit-- we don't increase our emissions. So that's a good thing. We don't make this number bigger. But we don't also decrease the emissions. The path that we're on now some someplace up here, so that by the end of the century, we pretty much quadruple the amount of CO2 we add each year to the atmosphere-- or greenhouse gases, I should say. And that makes the carbon dioxide concentration go up. We keep adding, and adding, and adding more of this. So by the time we get out to the end of the century, in this business as usual type scenario, made the concentration of CO2 in the atmosphere almost 1,000 parts per million, three times more than we saw-- almost four times more than we saw before we started anthropogenically adding CO2 to the atmosphere. That makes the world very warm at the end of the century. Changes on the order of 10 or 11 degrees C in the Arctic. And we're talking C. If you think in F, more or less double that number and we're talking changes in degrees F. Huge numbers. Even in our part of the world here, we're talking about changes on the order of 10 to 14 degrees F-- about 7 degrees C. On this other side-- the kind of more yellowy graph-- this is the graphic of what the climate will look like at the end of the century if we actually drastically reduce our greenhouse gas emissions. So I'm going to slide back-- not just keep them status quo, but actually reduce them, OK? So we're emitting less CO2 each year. Notice the colors in this-- they're are all still oranges and yellows. They're still in this range. The earth still warms by about 2 degrees C, even if we drastically drop our CO2 emissions. Again, a point of the climate system-- it has inertia. We've kind of pushed it in one direction. The analogy I like to use in class-- it's like a truck. You know, you're speeding along the interstate at 70, and you step on the brakes. The truck doesn't stop on a dime. It keeps going. The climate system is the same way. So we're locked into a certain degree of warming, really no matter what we do going on through the next century-- all the more reason to try to reduce these emissions so we look like this instead of that. Precipitation changes-- and I'm going to skip over that. Again, we can bring this closer to home. If we look at New York, yellow is the observations-- the temperature of the state of New York, all weather stations' average over New York. The grey band is what the climate models say the temperature of New York should have been. So one point I want to make here is the climate models do a pretty good job of getting the range of temperatures we've seen in New York over this period of time. Couple-- maybe that year was a little bit warmer. Then we go out into the future. And basically, what this is showing is how temperatures will change if we do this higher emissions scenario-- business as usual-- quadruple our CO2 emissions by the end of the century, versus if we kind of keep the same emissions we have today-- an atmosphere with three or four times as much CO2, an atmosphere with maybe about double the amount of CO2. Warming in both cases, but a very big difference in the amount of warming. And notice the red and the green overlap until about 2050. Again, this idea that the climate system has inertia. No matter what I do, starting today, I'm locked into about 50 or 40 years of the same change. And then, I see that manifest itself out into the future. Big problem when we talk about maybe strategies for mitigation. That problem's way out there. But we have to act now because that's affects what-- there's no way we're going to solve the problem when we're out there already. And I'm going to end, I think, on this slide, as we're kind of getting close to time. And I use this slide because-- I said this a number of times when I've spoken to audiences on climate change. It really blows my mind, I guess. What I'm showing is central New York. The blue is the historical record up through about 2000. And in this slide, the gray area represents the range between the warmest year that central New York has ever seen, and and the coldest year that central New York has ever seen. So it's kind of the envelope of history. The red and the yellow represent the simulation into the future. So again, a high emission scenario and a lower emissions scenario. And like I said in the last slide, we get out to about 2050, 2040, and they both move about the same way-- not too big of a difference between these two lines. They only diverge after about 2050-- high emission scenario much more than the low emissions scenario. But notice these points here, where I've drawn lines going downward. They represent points in the future where what we call the coldest year on record will be warmer than what we called the warmest year on record. All right. So let me-- did I say that right? So our coldest year on record will be warmer than the warmest year we saw in the past. That just blows my mind, particularly when this is occurring-- 2050. 2050. 40 years from now. You know, I still have a chance of being alive 40 years from now. And I might see that. That just drives-- you know, especially being a skier and living through this winter, you know, that blows my mind in some ways. So keep that in mind. I forget. No. We can skip all-- yeah. Last thing. I was supposed to talk a little bit about impacts. And since we're in New York-- obviously, I've talked about temperature. I'm a meteorologist. But sea level rise is also part of this. And I don't think one of-- I don't think a talk in the seminar series really deals with sea level rise. But kind of put this on here some projections, actually from our climate study from New York because clearly, if you're the governor of New York, and you're worried about climate change-- or the mayor of New York City-- it's sea level rise that you're really worried about. And a point to show we're here in New York, and somewhere here out in the-- this is New York City. Out here at the end of the century, you know, the projections from the models for the different greenhouse gas scenarios-- we're talking about a foot of sea level rise. A foot of sea level rise. But with a lot of uncertainty. This kind of upper area here is something actually that the mayor in the state of New York asked us to look at as kind of a high risk maybe low-- high risk, low probability scenario to say, what if the major ice sheets-- Greenland, Western Antarctica-- actually totally melted. There's some evidence for that. Like I said, high-- low probability, but high risk. What would sea level look like in New York City? And there-- look at the numbers. We're working in inches. So five feet of sea level rise in these areas. And as an example-- it doesn't show up very good. I happened to draw, if anyone can see, this is the Arthur Kill. So Staten Island over here. This is New Jersey. And notice all of these kind of gas storage tanks and things like that that are kind of greyed or blued in. Those would be underwater with three feet of sea level rise. So something on the order of-- right about here. High end of maybe what the models say, but still within the realm of possibility. Think of that in terms of impact. You know, you've all been to the city. Think about all the infrastructure that sits right along, you know, the rivers and the coasts, and things like that, the harbors. And we're looking at this degree of sea level rise. So that's my quick summary of impacts. So I will open it up for a question or two, and that means you guys can go, I guess. But if there are any questions, go ahead. Go ahead. AUDIENCE: [INAUDIBLE] ART DEGAETANO: Thank you. [APPLAUSE] AUDIENCE: Would you say that it's not yet clear that we're already in a rapid ice melt scenario? ART DEGAETANO: Say that again? AUDIENCE: Is it-- can we-- when can we say that we're already in a rapid ice melt-- ART DEGAETANO: I mean, in my opinion, it's much too early to say we are in that situation. And I mean, with a rapid ice melt, there's just-- the science isn't quite there yet. We don't know the dynamics of the ice sheets and things like that not simulated well in models, and things like that. A lot of those simulations for that rapid ice melt have to do with looking at periods of the earth's time in geologic history when the ice sheet did melt, and looking at paleoclimate evidence, sea level rise, and things like that. Yeah. That's why I said, high risk, low probability. But you know, if you're thinking of spending billions of dollars for seawalls or things like that, I would assume if you're a policy maker or the governor, that's something you want to have in the back of your mind in terms of at least knowing what the risk is of something like that. Any other question? AUDIENCE: I noticed that there was a high heat gain-- temperature gain in the 1940s. That graph-- ART DEGAETANO: Yeah. AUDIENCE: It seemed to correspond with the war. I don't know-- ART DEGAETANO: Yeah. No. I guess I did want to-- I ran out of time, and that's where I kind of alluded to it with the sulfate aerosols. I don't know if I can go back. I actually want to pick on maybe-- I want that one, actually. Really, we can think about the climate as changing in kind of maybe like two slugs. Or actually, I think of it as four periods. We have a cooling period, we have a warming period, we have a stable period, and then we have a warming period. If we kind of dissect this with the climate model, what we typically-- or what most people attribute this to is this warming here is mostly natural causes. You can't really replicate this with greenhouse gases. You have to take into account the natural changes in the climate system. This middle period here is kind of weird. And some people attribute that to actually sulfate aerosols that were burning lots of dirty coal there, putting lots of sulfate aerosols in the atmosphere, which reflect sunlight and actually cools the climate. So we might see this as actually sulfates in the atmosphere, pollutants in the atmosphere, and of counteracting the warming trend. And then as we've cleaned up coal but added more greenhouse gases, we see the warming kind of shoot out from there. AUDIENCE: I have question from the WebX. ART DEGAETANO: OK. AUDIENCE: Do clouds have an effect in terms of balancing incoming and reflected energy? ART DEGAETANO: In balancing it? I would say they don't have a role in balancing it. They-- basically, in the end, they do both things. They trap longwave radiation, and clouds block incoming radiation. And really, in the end, the net effect of clouds is really very close to zero. So they kind of play a dual role in the system. So they really don't have a big role, at least in the current climate system of balancing or counteracting one or the other. Back of the room? AUDIENCE: You had that slide of the feedback systems. But there wasn't any real example of a good negative feedback [INAUDIBLE]. Is that [INAUDIBLE]? ART DEGAETANO: I would argue it's hard to find a good negative feedback. That's-- AUDIENCE: So which do you feel is the most promising of what we've got to work with? I mean, I understand that we need to reduce our emissions. But which of the feedback loops do you feel like has any promise to work-- to be [INAUDIBLE] ART DEGAETANO: To bail us out the problem? Is that-- AUDIENCE: [INAUDIBLE] to have a negative loop rather than all positive. ART DEGAETANO: I cannot think of-- I don't see any of the feedbacks as being a potential saving grace. If anything, I see the feedbacks that are out there that may be negative as maybe moderating the change a bit, but in no way getting us out of the problem. And any of the more negative feedbacks operate on very, very long time scales. So I might be able to think of some negative feedbacks that act on the 100,000 year time scale, but I would argue that's not going to do us any good. AUDIENCE: And is it completely inconceivable that wavelength can be affected by science? I actually don't know anything about wavelength. ART DEGAETANO: No. Wavelength is wavelength, and there is nothing we're going to do to alter the wavelength, unless we-- no. You know, really, the thing-- if science or engineering is going to do something, really any-- if you've heard of the term geoengineering, a lot of the geoengineering ways are ways that we might change the albedo of the planet. So maybe somehow artificially make there be more low clouds over the ocean, or put stuff high up in the atmosphere to reflect some sunlight. But I don't know if I'm ready to go there yet. AUDIENCE: The scale of that is sort of-- ART DEGAETANO: Is huge. And the risk of that going awry if we don't have it right is also daunting. Yes. Go ahead, David. DAVID: Yeah. One quick physical question, then one other question about feedback loops. The physical question is it appears that-- I mean, everybody who is interested in geothermal energy knows that there's heat that radiates from the center of the earth out. And that seems like totally irrelevant to all these [INAUDIBLE]? ART DEGAETANO: I would say in this case, it's a drop in the bucket to all these calculations. It's there, but it's-- I don't know what the number is, but it's small. It's point something, or. DAVID: It's definitely there, it's just tiny. ART DEGAETANO: Yep. DAVID: OK. Second question is about a couple human responses-- you're basically saying that anthropogenic forcing is really the major factor that's driving a lot of the change. So my question is about whether the models are naive about human responses beyond the policy changes about reducing emissions. What I'm really trying to get at is I could see other feedback systems-- for example, when it gets hotter, people burn-- you know, they want to use a lot more air conditioning, which burns more fossil fuels. ART DEGAETANO: Right. DAVID: So I'm asking whether these models are naive about that kind of change or not. ART DEGAETANO: I would argue yes and no. And basically, there's been a shift in the way-- at least from the climate side of things-- in the graphs that I showed about the future, and I said business as usual scenarios and things like that. In those scenarios, that's when, you know, you maybe get a bunch of policy people, and sociologists, and economists in a room and try to say, what is the world going to look like in 100 years or something like that? And to be quite frank, I don't know if they say, yeah, if it gets hotter, people are going to have more air conditioning and things like that. But anyway, more to the point-- lately, in the last IPCC report, they've gotten away from that. And they basically made their scenarios say, what is the degree of radiative forcing that there is in the atmosphere? So that's-- 8.5 is kind of we keep emitting like we are. 4.5 is kind of the old kind of-- the more environmentally friendly thing. So they really, at least from the climate side of things, kind of gotten away from this idea of things like you're talking about, and kind of focused more in to say, all right, yeah, you can change policy in a lot of ways to keep the radiative forcing within a certain level. And whether you prevent people from adding more air conditioning, or do this or do that, doesn't really matter. The key thing in the science and the physics is what is the forcing? Does that makes sense? DAVID: Yeah. ART DEGAETANO: Yeah. Jonathan? JONATHAN: Yeah. I just-- mostly it's not a specific question. Maybe you could comment on this a little bit. A lot of us were at a top 21 colloquial last week [INAUDIBLE]. ART DEGAETANO: Oh, that's-- JONATHAN: Bob Howard was talking a little bit on the same topic as your projections and the inertia of the system. And you can probably guess where I'm going to go with this. ART DEGAETANO: I do, and I-- JONATHAN: He was-- you were emphasizing how much inertia there is when the CO2 responds per se when you put CO2 in. And he was emphasizing that if you wanted to achieve more short-term effects by 2050, that some of the short-lived [INAUDIBLE] ART DEGAETANO: Was bringing up the-- was reducing the methane. Yeah. I saw his quote. And to be quite honest, I did a-- it kind of struck me as peculiar. And I actually spent a little bit of-- I guess it wouldn't have been what I expected. And I don't know. Maybe Peter can help me out here. I couldn't immediately-- when I read it, I couldn't immediately come up with a reason why methane in the short term, you'd get more bang for your buck in really short term. And I realize methane is a more powerful greenhouse gas molecule per molecule, kilogram per kilogram. But the way I saw his quote, it didn't quite capture it that way. And I was going to look into it but ran out of time. I'll say it at that because it did strike me as being intriguing. Do you have anything to add to that, Peter? PETER: [INAUDIBLE] besides being a very strong greenhouse gas was its short lifetime in the atmosphere so that when you change the emission rate, you change the concentration in the atmosphere more quickly than you could with CO2, which is going to-- what you already put out there is going to hang around for hundreds of years. JONATHAN: Well, I'll talk about that in a few weeks. ART DEGAETANO: All right. Sounds good. Thanks for the foreshadowing. Yes. AUDIENCE: A lot of climate change deniers frequently cherry pick that 1998 year. ART DEGAETANO: Yeah. AUDIENCE: And they say, like, 17 years back, it hadn't changed, [INAUDIBLE] stuff like that. I'd just like to hear the professional response to that. ART DEGAETANO: Am I allowed to say that in a public venue? Yeah. I mean, I think you've hit it very much. They've cherry picked their data, basically. And even if they didn't-- even-- right. They've-- there's lots of trends. You can draw your trend over any period of time, and they happen to chose the period of time where there's little trend, or maybe even a slightly decreasing trend, and things like that. Moreover, you know, this idea of climate change doesn't mean that one year after the next has to be warmer than the next. So it's perfectly reasonable to say there are natural things-- natural things in the climate system that we have a period of cooler years that kind of counteract that trend. People who have been in my class have seen-- I love the slide where it's a guy walking along a sloping line, and he's walking his dog. And his dog kind of wanders all over the place, like a dog does, as he moves along this upward trending path. So really, I would argue this 10 year or 17 year period is no more than the dog liked something, and it happened to be on the cooler end of the scale. But the whole system is still moving up to cooler and cooler temperatures. Does that kind of-- and I actually-- oh, I just-- in my role as editor, there actually was a paper that we looked at that actually even the scientists to say-- you know, it kind of faulted the scientists for kind of picking up on this term a hiatus or pause and actually making a bigger thing out of it than it was in the literature that they-- where you would perfectly expect that to happen in a trended data series. AUDIENCE: On the topic of is there a-- if I'm going to be the armchair scientist, and I've got all all the numbers, and I've got honest numbers, how big is my boxcar filter that I run over the data before I say, ah, there is a trend? Is it seven years, 10 years? What would be something that would reliably tell me, yep, we busted something. ART DEGAETANO: I think the way-- I don't think there's-- there's not a single answer to that, all right? So I think the best way-- you know, it's really-- one way you can look at it, you have enough data, and the data are clean enough and free of blemishes, you can do the statistics and say, boy, there's no way I would expect a trend this significant with this much data. More importantly, I think that's really where we have to bring in our climate models. And we can use two things in our climate models. We can simulate the current climate system with the models. And I would argue they do a decent job of looking at that for the entire globe. And then a climate model is neat because you don't just have 100 years of data. But with the climate model, you can simulate 100,000 years of current climate conditions and look for the trend that we've seen and say, boy, do I ever see this? You know, it's-- an analogy I like to use is like playing poker, right? I can deal you a couple of decks-- a couple of hands, and you might not get a royal flush, and you might think, oh boy, there's no chance in heck I'm ever going to get this because I've only dealt you three or four or 10 hands. Well, you only have 100 years of data. With the climate model, you can get an appreciation for the full possibility and see if that trend is something you would ever expect to see. Does that kind of get at your question? AUDIENCE: Other data that are available to everybody, looking for-- one thing that I always-- oh. Almost no new lows. Certainly new lows are not coming along [INAUDIBLE] new highs. And you can get that from airport historical climate stuff for all of the country. ART DEGAETANO: Yeah. For something like that, yeah. I guess the one nuance I would put there is-- again, in the world, until very recently, our weather or climate observations were never quite intended to look at long-term trends. So again, if anybody's left from my class, if I looked at the Ithaca-- the historical temperature record for Ithaca, today, the thermometer is at Game Farm road. Back in the '30s and '40s, the thermometer was on the roof of Roberts Hall. So can you guess when the warmest period of record is in Ithaca? When the thermometer was on the black roof of Roberts Hall. So you have to know those types-- if you're-- using the entire globe is nice because you can even out all of those blemishes. But if you're just looking a station, you have to be careful and know your data. It's more than just grabbing the Ithaca record from the NRCC website. AUDIENCE: We have one more from the WebX. ART DEGAETANO: OK. AUDIENCE: Can you relate weather chaos or extreme weather events to global warming? ART DEGAETANO: I would say yes, you can relate them. But can you attribute them to global warming? It's another story. I would say there's lots and lots of ingredients that cause a Hurricane Sandy, or the blizzard of 2016, or the warm winter, or the warm December of 2016. Climate change, global warming is part of that, but there are a lot of other things that are going on. So again, it's an example of as we see more and more and more of those types of things, then it gets to be easier to say yes. But in the current situation, I think they're good analogies to what we expect to see in terms of heavy rainfall and high storm surge and things like that. So that's it. It's happy hour. [APPLAUSE] SPEAKER: This has been a production of Cornell University. On the web at Cornell.edu. How can adding a bit more of a gas that makes up much less than 1% of the Earth’s atmosphere be responsible for causing the greatest environmental dilemma of our and our future generations’ time? 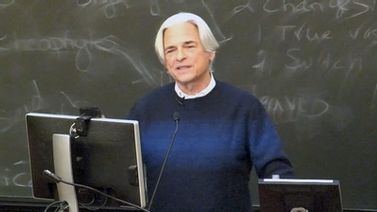 In this talk, Art DeGaetano develops a very simple model of the Earth system; then, using some basic math and physics, shows how altering the atmosphere’s greenhouse gas concentration requires that the temperature of the Earth’s surface increase. Learn how other man-made influences also affect the climate system and demonstrate how many of these changes are exacerbated by feedbacks. Then take a trip back in time to examine how atmospheric carbon dioxide has influenced the Earth’s temperature in the ancient past, how temperatures over the last century, and how continued increases in greenhouse gas concentrations are projected to affect the climate of the next 100 years, from both a global and a local prospective.